Art-C: Ajantha & Ellora....cave monuments that have stood the test of time!!! 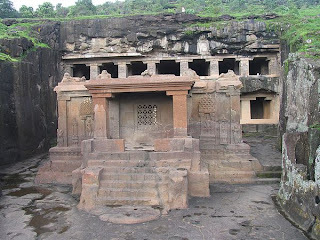 Ajantha & Ellora....cave monuments that have stood the test of time!!! The caves of Ajantha & Ellora situated just outside the village of Ajantha in Aurangabad district, India, are monuments that stand testimony to the ravages of time. They consist of 30 cave monuments hewn out of rock whose walls are filled with pictorial art in general & Buddhist paintings & sculptures in particular. They have been a part of the Unesco World Heritage site ever since 1983 to protect their cultural & creative significance. The Ajantha caves were partly created in the 1st century BC under the Satavahana dynasty & the remainder of the monuments were created in the 7th century under the Vakataka dynasty, ruled by emperor Harishena. The murals found here are considered to be the oldest monuments of painted art in India. At the end of his dynastic rule, these caves were abondoned & undisturbed for 1300 years, aided by the dense jungle growth & were re-discovered only in 1819 by the British army officer John Smith, whose name is visible on the walls even today. The caves are beautiful to behold, because of their impressive architecture, paintings & the stories they tell. The whole structure is hewn into the surrounding rocks, including the pillars, the spacious courtyard, the pillard portico & the various vestibules. The paintings, carvings & decorative motifs present all over the cave, although eroded by time & human interference, are fairly visible & detailed narrating the Jataka tales & depicting the stories & scenes of the Buddha's life in great detail. The murals found in the caves use the techniques & processes that are unlikely ever to be found in the art history of other civilizations. To create these murals, the rock surface was first chiselled, a plaster made of clay, dung & lime was applied, drawings were done & colours applied while the plaster was still wet. The colour was then soaked in by the wet plaster, becoming a part of the surface & thereby retarding decay & peeling to a major extent, elongating the murals life. The Ajantha & Ellora caves are a must see for their uniqueness & for the belief that true art can surely stand the test of time!! !